Some pictures say it all[ii]. Rohitha Rajapaksa is President Mahinda Rajapaksa’s youngest son. He is not a parliamentarian, a provincial councillor or even a Pradesheeya Sabha member. He is not a public official, an academic or any other professional. So what is he doing in the official Lankan delegation which met Indian Prime Minister Modi during the Kathmandu SAARC summit? As The Sunday Times reported, India at this meeting was represented by her Prime Minister and other heavyweights such as External Affairs Minister, National Security Advisor, Foreign Secretary and Ministry Spokesman/Joint Secretary[iii]. (Incidentally, but significantly, the Indian team included one Sikh and one Muslim while the Lankan side consisted of just Sinhalese). Sri Lanka was represented by her President, External Affairs Minister, Monitoring MP of Foreign Ministry, Foreign Secretary and the President’s youngest son. The picture demonstrates the state of the Lankan state after nine years of Rajapaksa rule. It also foretells the future awaiting the Lankan state if the Rajapaksas win this election. 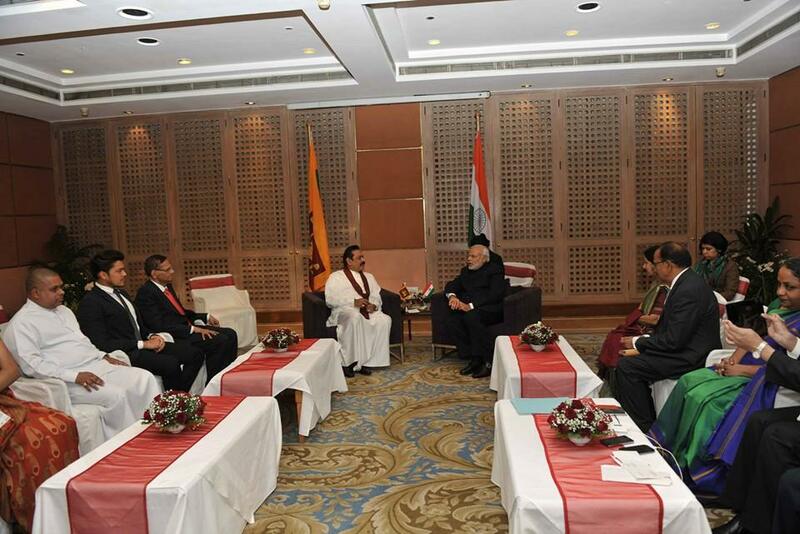 Rohitha Rajapaksa was the second in line to be introduced to PM Modi, after Minister GL Peiris. Lankan Foreign Secretary did not even get a handshake from the Indian PM[iv] – a stark illustration of how humiliatingly low the once excellent Lankan Foreign Service has fallen. The issue is not that Rohitha Rajapaksa hitched a plane-ride with his presidential father at public expense. Politicians everywhere have always engaged in such unethical practices – and always will. If the youngest presidential offspring engaged in a shopping-spree in Kathmandu (or some other legal private-pursuit) it would have been utterly unremarkable. (After all, according to the young man himself, he loves shopping: “I shop everywhere, anything that fits perfect will be purchased, price and name does not matter”[v].) The issue is his inclusion in the official Lankan delegation which met the Indian PM – and the primacy accorded to him, in gross violation of all protocol. After all, Rohitha Rajapaksa is just the President’s son. But in Rajapaksa Sri Lanka, that kinship ranks above every other position, qualification and capacity. In a presidential-election ad, President Rajapaksa proclaims, “What I value firstly is my motherland; secondly also my motherland; thirdly also my motherland. It must be the same for you and the entire nation”. In actuality, what President Rajapaksa values firstly, secondly and thirdly is familial-power. And he wants the entire nation to accept that prioritisation as the only correct and patriotic one. This election is all about keeping, by whatever means necessary, the enormous and arbitrary powers he and his family have amassed since 2005. In another presidential-election ad, President Rajapaksa proclaims, ‘For five years now we have enjoyed absolute freedom’. Indeed, for five years they, the Rajapaksas, have ‘enjoyed absolute freedom’, at national expense. They have enjoyed the freedom to treat the country as their fiefdom, the state as their private preserve and the treasury as their pocket-book. The inclusion of Rohitha Rajapaksa in the official Lankan delegation is one more result of this ‘absolute freedom’ the Rajapaksas are enjoying, untrammelled by laws, traditions, protocols, intelligence, basic commonsense, decency or a sense of shame. Rohitha Rajapaksa was once asked what his ‘prefect day’ would be. His answer was, “Wake up and workout with my girlfriend and friends, finish my work, have the freedom to face the rest of the day, watching movies and riding bikes and end it with a good dinner with all my friends”[vi]. This unintelligent layabout was placed third in an official Lankan delegation. Do we need any other evidence to understand the crippled nature of the Lankan state? Do we need any other proof that the Rajapaksas must not be given a third term? Political families enjoy political power – but it is generally unofficial and behind-the-scenes. This is so not just in democracies but even in functional non-democracies. Sri Lanka is obviously a glaring exception to this sensible rule. Those SLFPers who have opted to support the Rajapaksas should take a good look at the picture. It foretells the utterly servile future which awaits them, if the Siblings win this election. In the above-mentioned interview Rohitha Rajapaksa was asked how he would describe himself in two words: and the answer was ‘Just Right’. Imagine a Sri Lanka run by these Baby Docs! Is that the future we want? After the bloody defeat of the second JVP insurgency, President Ranasinghe Premadasa appointed the Youth Commission to study the causes of Southern unrest. The Commission identified politicised recruitment to the public sector as a major cause of youth disaffection and recommended the institution of a merit-based system of recruitment via a competitive exam. President Premadasa promptly implemented the recommendation. That system survived until the Rajapaksas came to power. The Siblings’ aim was a state which was a fiefdom, run by Rajapaksa servants. The merit-based recruitment system was an impediment to that goal. Therefore it was replaced with the viva system, so that kith/kin can be favoured over those who excel at competitive exams. The JVP, which was still a Rajapaksa-ally, aired its objections at a Financial Consultative Committee meeting. President Rajapaksa reportedly responded by saying that he has to look after those who helped him electorally and politically. He asked the JVP to forward its own list! That change was an early indication of where Sri Lanka was headed under Rajapaksa rule. Bad habits and practices are easier to institute and harder to efface. If the Rajapaksas win this election, the inclusion of presidential offspring in official Lankan delegations will become a standard practice. Most Lankans will become habituated to it, and forget this was unthinkable before the Rajapaksas overran the state. Seif al-Islam, Muammar Gaddafi’s heir-apparent got himself a degree from the LSE, via a donation of 1.5million sterling pounds[viii]. Dynasty-building fathers generally use public funds to gild their drossy-offspring. The gilded-offspring are then introduced to the nation as stars. In Libya the ruse worked for a while. According to a 2010 Wikileaks cable, “…young Libyan contacts had reported that Seif al-Islam is the ‘hope’ of ‘Libya of Tomorrow’, with men in their twenties saying that they aspire to be like Seif and think he is the right person to run the country”[ix]. If the Rajapaksas win this election, someday soon, Lankan youth will regard the three Baby Docs as role models, worthy of emulation. Defeating the Rajapaksas is not a panacea for all ills. But if they are not defeated on Jan. 8th, the cancer of intolerance, abuse and impunity will sicken supporters and opponents alike, and lead Sri Lanka to a Libya-like morass. [i] The caption in a presidential election newspaper ad.